KATHMANDU, Feb 23: CPN (Maoist Center), the junior partner in the ruling alliance, is likely to get seven ministerial portfolios including home affairs in Prime Minister KP Sharma Oli’s left coalition government. 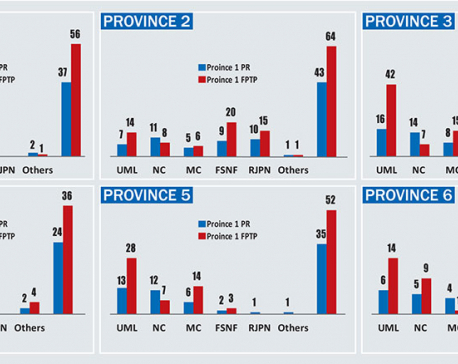 The CPN-UML may hold 10 out of 17 ministries, excluding the office of prime minister, according to an informal understanding between leaders of the two parties. 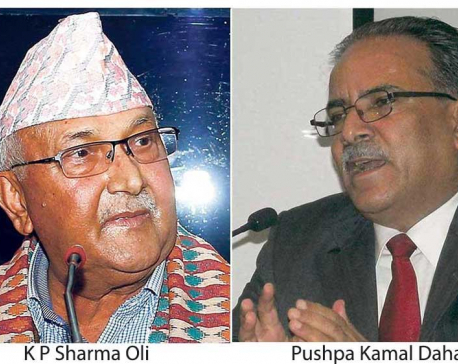 PM Oli, who last week took the helm of government two months after steering the left alliance to a historic win in the federal and provincial elections, currently has a three-member cabinet including two ministers from UML. Leaders said the share of ministries could decrease if the Federal Socialist Forum Nepal and Rastriya Janata Party Nepal join the government. PM Oli is scheduled to hold a meeting with FSFN Chair Upendra Yadav. “Discussions are still underway. Leaders of the two parties will take a decision on Friday,” Maoist leader Matrika Yadav said. As per the understanding, UML will hold various important posts including foreign affairs, finance and defense. Despite the distribution of ministerial portfolios, it is likely to take a few more days for the cabinet to get full shape. Both Oli and Dahal continued discussions with party leaders Thursday to finalize the names of MPs who will represent their parties in the cabinet. But neither party was able to finalize the names owing to factional feuds and tussles between key aspirants for portfolios. As intraparty feuds show no signs of ending a week after the formation of the government, both parties are planning to appoint their ministers in phases. “The party has already decided to join the government under the leadership of Badal Ji (Ram Bahadur Thapa ). There has also been consensus on a few other nominees. What remains now is assignment of portfolios,” said Maoist leader Yadav. Among the Maoists, a row over the Ministry of Home Affair has prevented Dahal from deciding the MPs who will join the government in the first phase. Badal, who is conformed to lead the third largest party in the new cabinet, has staked a claim to the Home Ministry. Other key aspirants of the party including Barshaman Pun and Janardan Sharma have also expressed interest in leading the Home Ministry. Some probable faces in from the Maoists include Lekhraj Bhatta and Pampha Bhusal. Chakrapani Khanal, Shakti Basnet, Amik Sherchan, Girirajmani Pokharel and Devendra Paudel are also seen as possible contenders for ministerial berths. At the UML also, a similar row rages over key portfolios like finance, defense and foreign affairs. UML General Secretary Ishwor Pokharel is likely to hold the Finance Ministry. Other probable candidates include Pradeep Gyawali, Yogesh Bhattarai, Rabindra Adhikari, Bhanubhakta Dhakal, Naradmuni Rana, Basanta Nembang and Shanta Chaudhary. Unlike the Maoists, the UML leadership is also under big pressure for a fair distribution of portfolios among the various factions led by senior leaders Madhav Kumar Nepal, Bamdev Gautam and Jhal Nath Khanal.